The kit is due for release in August. See the photos by reading on. Check out this Five Star Stories – Gastness Temple Version 2 Model Kit from E2046. The 1/100 scale model kit will stand just under 12″ tall. This is part of the Gathering line of pre-painted model kits. It is priced at $212.99 with a release date scheduled for April 21st. You can pre-order it Here. See a few photos after the jump. Check out the new Gundam MSN-04 Sazabi Ver. Patch Work Pre-Painted Gathering Model Kit from our friends at E2046. The 1/100 scale kit stands 11″ tall model kit comes pre-painted with some minor assembly required. It includes a small bust of Char Aznable, a shield and a gun. Priced at $299, the kit is expected to be released April 30th. You can pre-order it Here. Kotobukiya has revealed another Frame Arms Model Kit. This time it’s the Frame Arms NSG-Z0/D Magatsuki Plastic Model Kit. Like the E Durga I, this is being released at /100 scale, which means the kit stands at 6.5″ tall. It also features 30 points of articulation. This fully painted model kit is also due out this August. A KOTOBUKIYA Japanese import! Continuing the hit line of original robot model kits in the Frame Arms series are two brand new designs starting with a unique robotic samurai, the NSG-Z0/D MAGATSUKI! Featuring large feet, ornate hip armor, arm shields, and a decorative head, the Magatsuki is resplendent in its royal crimson and silver color scheme with aqua highlights and is sure to stand out in your display. Like the other Frame Arms robots the NSG-Z0/D has a basic robot skeleton, or “Frame,” which is highly articulated and covered in universal 3mm attachment points. Its armor and weaponry is unique, while all parts are fully interchangeable between all Frame Arms units and compatible with Koto’s M.S.G. (Modeling Support Goods) series of support units as well as the Border Break robots. Comprised of approximately 300 pre-colored parts, the Magatsuki stands over 6 ½ inches tall (1/100 scale) with 30 points of articulation for extreme poseability and a full array of interchangeable weaponry! Read on for a few photos. 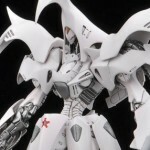 Kotobukiya has posted images and info for a new Frame Arms NSG-Z0/E Durga I Plastic Model Kit. At 1/100 scale, the kit stands at 6.5″ tall and features 30 points of articulation. The fully painted model kit is due out this August. A KOTOBUKIYA Japanese import! The second in a new wave of original Kotobukiya robot model kits brings a sleek metal knight to your collection with the all new Frame Arms NSG-Z0/E DURGA I! Resembling a giant robot clad in striking purple, yellow, and red medieval armor, the Durga I features heavy plating especially on its knees and massive shoulders. The knightly look is completed by a crested helm-like head unit, and traditional melee weapons like a giant-sized lance and mace! All Frame Arms robots including the Durga I have a basic robot skeleton, or “Frame,” which is highly articulated and covered in universal 3mm attachment points. Its armor and weaponry is unique, while all parts are fully interchangeable between all Frame Arms units and compatible with Koto’s M.S.G. (Modeling Support Goods) series of support units as well as the Border Break robots. Standing over 6 ½ inches tall (1/100 scale), the Durga I is comprised of approximately 400 pre-colored parts and when fully assembled features 30 points of articulation for great posing options. Our friends at E2046 have sent along word of a new Gundam model kit they are releasing. They have released pricing and images for a RX-93-2 Hi-Nu Gundam Pre-Painted Gathering Model Kit. this 1/100 scale model kit will stand just under 12″ tall. 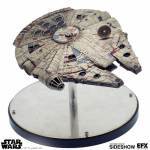 The kit requires some assembly and includes a display base. The kit is priced at $229.49. You can pre-order the RX-93-2 Hi-Nu Gundam Pre-Painted Gathering Model Kit at E2046. Kotobukiya has revealed a new Metal Gear Solid 4 – Metal Gear Ray 1/100 Scale Plastic Model Kit. The kit stands at 210MM, just over 8″, tall. It includes miniature figures for Old Snake, Liquid Ocelot and three Haven Soldiers. If the near $500 3A Metal Gear Ray is too far out of your price range, then this one should be a little easier to swallow. It’s going to sell for 8,400 Yen (about $80 USD) with a release in April 2014.